Fraudsters are everywhere. This revelation isn’t meant to cause paranoia in you. You should realize and accept that there are always heroes and villains, good and evil. If you are involved in online dating and have an account on one of the dating sites, you must have heard about online dating scams. 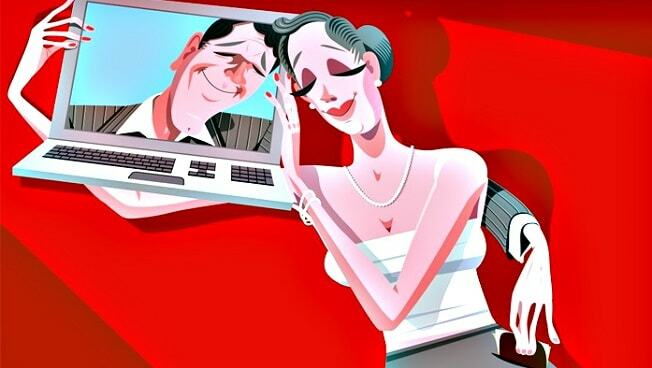 Many men who can’t find the love of their lives in real life often hesitate to embark on online searches of a future spouse since there are many articles on the Internet that warn men against scams on dating sites. Yes, dating scammers do exist, but the good news is that this fact mustn’t scare you off as they are quite easy to detect. They use standard patterns in their schemes, so if you’re careful enough, you’ll suspect something. The geography of scammers is diverse. However, the most notorious scammers on dating sites come from Eastern Europe. The reputation of many Russian dating sites has been tarnished due to scam reports. This is a vivid example of generalization: some fraudulent sites undermined the reputation of the whole dating industry. It made men doubt the security of such reliable dating site as jump4love. Scams happen even on this site, but they are rather an exception than a rule. The site is reputable and it has been on the market for more than a decade. This fact is indicative of people’s trust and site’s quality. However, there isn’t a site that would be totally secured against scammers. It’s impossible to verify each profile created on the site. The signs of a scammer can be spotted only in the process of communication with one. Many foreigners want to meet Russian women online. These women are mesmerizing, so men easily fall in love with them. Scammers are perfectly aware of it. They know how generous men get when they are in love, how easily they are manipulated, and how willing they are to part with money just to please the woman of their romantic interest. Their main aim is to get money, and they come up with new and new excuses to receive it. However, the most cautious of them try to win your confidence first. Usually, dating site scams unfold in five stages. The first stage is finding a victim. Scammers can’t wait until you contact them in some miraculous way. So, they go on a hunt themselves. They take the initiative and contact multiple men. Their first messages are flirtatious and catchy so many men swallow the bait. The aim of the second phase is to make the “victim” fall in love. Some scammers contact a lot of men and reply all of them, while some are more selective and focus only on one at a time. The first category is more obvious since their messages are universal as they’ve been prepared for a large audience. When these scammers receive many replies, they have to reply to some and ignore the others. The second category of scammers is pickier and more delicate. They focus on one man but diligently reply to all messages, elicit more details, make good conversations. Yet, the tricks and further actions are the same. The third step is to ask for money. Actually, this is their main purpose. Scammers know how to choose the right moment for a request. Once they know that trust is gained and a man is in love and ready to do many things for “her”, there comes the request for money. Usually, excuses are similar – money she needs to buy a ticket to fly to you, visa expenses, a sick relative, etc. Next stage is the retention of the man on a leash. A scammer will receive money and then will come up with a new financial problem and ask for money again. It will sound so plausible that the man will surely help his online girlfriend. The fifth phase is disappearance. At this stage, some scammers will try to get out of the relationship gradually. Some will just ghost abruptly. If a man really fell for that girl, it can be heart-breaking for him to realize that she just used him as a wallet. Jump4love scam cares about the safety of its users and presents 3 internet dating scam stories reading which you’ll learn from other people’s mistakes. Danny, 34, a single father of one. I want to share my sweet sad story on a dating site. It happened 6 months ago. After my first marriage failed, I decided that I deserve to be happy with some other woman. I registered at this site and already next day I received a letter from her. Her name was Diana. I’m not a gullible guy and I know if a woman writes to me first on a dating site, she might be a scammer. Our conversations were interesting and meaningful. But I was suspicious anyway. I told her directly that she comes across as a scammer. She sent me her childhood photos and some photos of her family to prove that she is real. I was a bit ashamed for my doubts and we continued our online relationship. Then we decided that she should come to me to Australia. She had all the necessary documents but she didn’t have enough money to pay for a visa. I trusted her, so I sent the required sum. A day before the departure date, she called me begging to send $2,000 which she needed to prove her financial capacity. And I sent. Next day I was at the airport waiting for her. But guess what? She didn’t show up. The airline confirmed that she canceled her booking. She neither contacted me again nor replied to my messages or answered my calls. Just vanished. I lost her, my money, and wasted my one-week unpaid leave. Rob, 42. I don’t want to mention her name. She wrote to me first. She was 24, much younger than me and it was flattering she got interested in me. She told me many sweet things and compliments, and my heart melt. From our chats, I understood how bad Russian men are and it became clear to me why Russian girls like foreigners. Everything was going okay, but one day she told me her sister had a car accident and needs money for a complicated surgery. I knew her family is not very wealthy, so I felt bound to help. I sent her €2,500 and since then have never heard of her. Dave, 29. My story is both instructive and fun. My scammer wasn’t very careful and I figured her (them) out very quickly but I wanted to have fun so I decided to observe her (their) further actions. Why I mentioned “their”? I’m sure that was a team of scammers who worked shifts so I chatted with all of them. First, I thought my online mate had a bad memory, but then it appeared to me that each time I communicated with a different person. The way they complimented, flattered, and declared their love to me was really fun.